Production of my south-of-the-border town of Mescalero has slowed while I try to figure out some problems with the church roof. 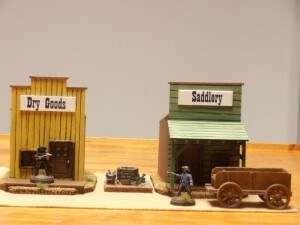 With all the amazing new Western buildings available from companies like 4Ground, Game On and Knuckleduster, to name a few, I thought I might as well start putting together a more traditional Western town. The trouble is those laser-cut MDF buildings can get pricey pretty quick. I first saw these PlastCraft Western Buildings on Miniature Market and I figured I’d give them a try. The kits are all basically the same, although the front of each building is different, and some have awnings while some do not. 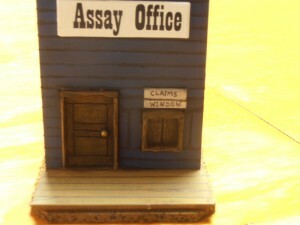 Each building kit comes with a resin door and window (varies by kit). You can’t beat the price: at less than $5 each I bought all six varieties. 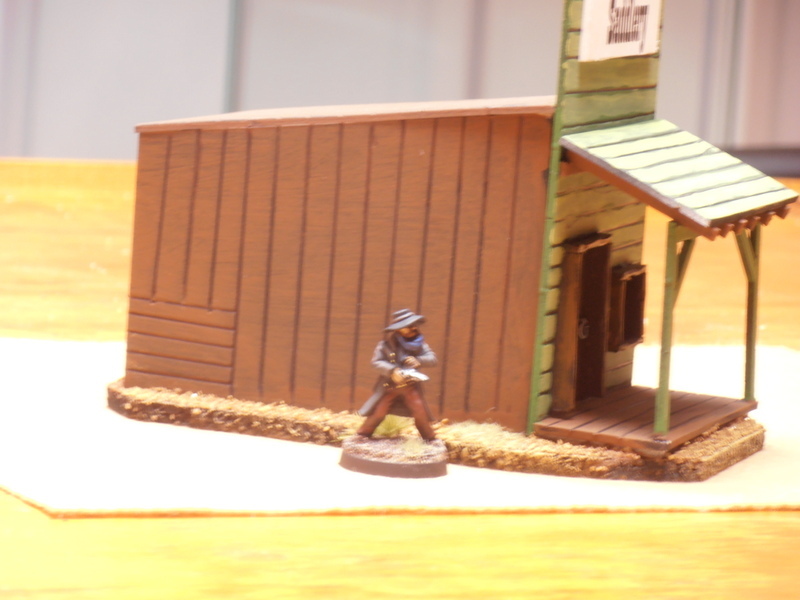 I posed some 28mm Blue Moon cowboys with these buildings to give you an idea of the scale. As you can see, the buildings are pretty small for 28mm and might be better suited to 15mm. The roofs are not designed to be removable, but I guess you don’t have to permanently attach them if you don’t want to. Regardless, the interiors are so small that there’s really no point in not attaching them. I have mixed feelings about these kits. I’ll give you my personal pros and cons, as well as discuss how I assembled them. I wish I had thought to take pictures of them before assembly, but I didn’t think I’d be writing a review of them. Sorry. The price. 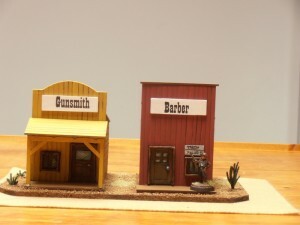 For less than $5 apiece, they make perfectly good small shops and won’t break your scenery budget. Once assembled and painted, they look nice enough. Once primed, the material takes paint well. Inexpensive craft paint was made for projects like this! You get a lot of extra card left over for each building, which is great for use in other projects, or to dress up these buildings (see below). The kits are somewhat fiddly to assemble, especially the awnings. Expect to get glue on your fingers. The resin doors and windows do not often fit snugly into the holes. There’s usually a gap, so you need to fill it with Green Stuff or something else. There is absolutely no texture to these buildings. Either you need to paint it to look like wood boards, or you need to score the material first. I opted for the latter. It’s easy enough to score, and it looks much better when assembled. The signs, like the building walls, are just blank card. Which means either stenciling, painting freehand, or doing what I did; which is printing out the name of the business in Playbill font and glueing it to the sign. The downside to this is it looks bright. I guess I could have used some other paper, but for the amount of use these buildings are going to get, it wasn’t worth it. All of the above makes assembling these buildings a more time-consuming task than you might think. The low price makes it easy to overlook the annoyances. 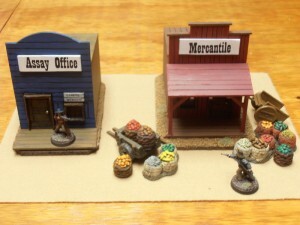 These kits would compliment some nicer buildings by the abovementioned companies, or may provide adequate scenery for a small outdoor skirmish on their own. You may notice I used some extra card bits to make signs on a couple of buildings like the one above. It won’t win any awards, but it adds a little something extra. You get plenty of leftover card to use in any way you see fit. For example, I considered making a plank bridge from one building roof to another, but scrapped the idea. After I painted them, I realized my Western buildings look pretty bright and clean! I’m thinking of adding some weathering pigments to them to dirty them up a bit. You could paint them with less color to give them a more hastily-constructed or ramshackle look, if you prefer. Yeah, if you’re looking to add a little extra to a town or if you’re on a tight budget (or both). As long as you have the patience to assemble them, these kits are fine for what they are, and a steal at the price.